1. To make the white sauce, melt the butter in a saucepan, add the flour and stir on low heat. 2. Season with salt and pepper. Add the milk, continue to stir until the sauce thickens. 3. Stir in the cheese. Remove the pan from the stove. 4. Put the marinade ingredients in a bowl. 5. Add the paneer and marinate for about 10 minutes. 6. 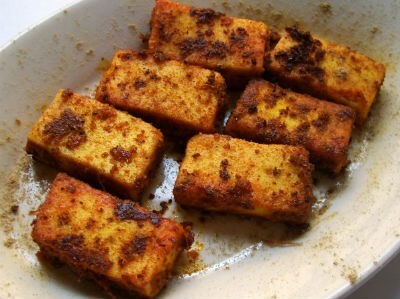 Heat the oil in a frying pan, shallow fry the paneer till it turns golden and keep aside. 7. Melt 1/2 tblsp of butter in a pan. 8. Saute the cauliflower and broccoli florets. 9. Season with salt, lemon juice and chaat masala. Keep aside. 10. Melt the remaining butter in a saucepan, stir in the basil leaves, oregano and fenugreek leaves. 11. Add the almonds, white sauce and cheese, season with white pepper and salt and stir on low heat for a minute. 12. Add the water and cook on medium heat for 2 minutes. 13. Adjust the salt and seasoning as required. 14. Add cream and stir to make a smooth sauce. 15. Carefully stir in the paneer and the vegetables. 16. Transfer to a serving dish. 17. Garnish with corn, capsicum strips and cheese. Feel free to comment or share your thoughts on this Almond Paneer in Cream Sauce Recipe from Awesome Cuisine.